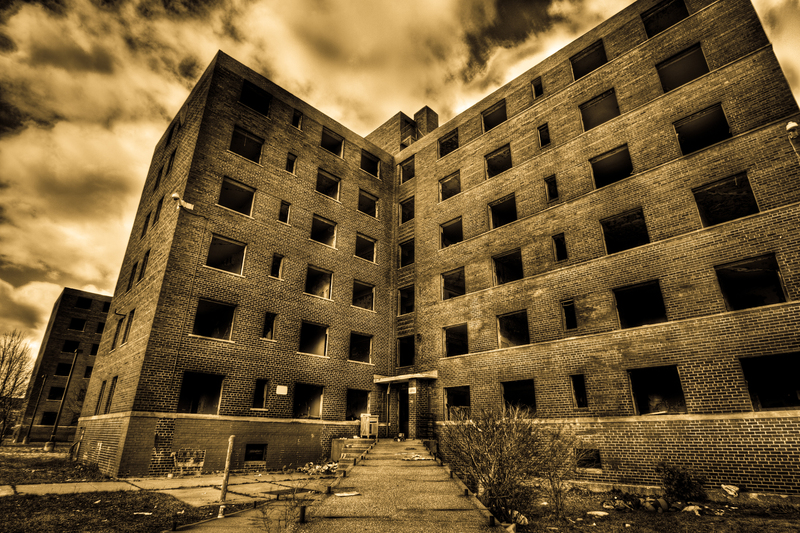 The entire apartment building was haunted—I could feel it in my bones. We stood there, staring up at the looming tower, which seemed to be the last dying thing against a backdrop of urban decay. Even the moon, which I could’ve sworn had been full and bright before we’d ventured into that part of town, refused to glow. Like a coward, it hid behind cloud cover, and I halfway couldn’t blame the heavenly body for doing so. “Will ya look at that,” Marq said, holding his cap to his head as a warm gust of wind sucked the breath from his broad chest. Lisa tilted her head back cautiously, as if the boogeyman was going to suddenly pop out and scare her out of her skin. “How do you know,” she asked, mesmerized by the five-story pile of bricks. “You sure we have to go in,” Marq asked. Though he was the largest of us—the highest curl of his head standing above mine a good two inches, his athletic frame draped in a football jersey—he was the most easily spooked. “You big wuss,” Lisa ribbed. She was rarely kind to her on-again-off-again boyfriend. For the moment, they were on the outs. I suspected she was pretty enough behind thick, pop-bottle glasses, but would never take them off for confirmation. Kissing her would be like kissing my kid sister—at least, that’s what I kept telling myself. She probably would’ve belted me if I’d tried. Despite wanting to push her aside, there was something about her plaited, sun-bleached hair and cocoa skin that sent electricity up my spine. Marquez shot me a frown, his café au lait face sprinkled with bits of coffee that were a major turn-on for Lisa. She loved the freckles on and green eyes set in his olive-toned face, while I silently pined for her. And Marq, well, let’s just say he was enamored with the reflection in every mirror he encountered. We were all children of Caribbean parents; Marquez’s folks hailed from Puerto Rico, Lisa’s from Jamaica, and me, a second-generation Haitian. We made for an odd trio but this was my crew. Clouds of moths, gnats, and mosquitos danced around the pale streetlamps. With the exception of the lights on the top floor, the building looked abandoned. That was where my father’s youngest brother, Georges resided. He’d called me and I came running to his rescue. I never asked why he couldn’t simply leave on his own. I put on the spectral specs I’d fashioned and didn’t have to question his logic—the place was overrun with ghosts like a Chicago apartment with a cockroach infestation. I had a deep disdain for cockroaches. They (the ghosts, not the bugs) swam in and out of the windows, most of which were broken, the jagged edges of glass having no effect on their ethereal movements. “Whaddaya see,” Marq asked nervously. I grinned. Dead leg on a crooked love triangle or not, I was the de facto leader; the brains of the outfit, if you will. Oh, you’re probably wondering about my name. Well, let’s just say my mom and dad wanted to pay homage to an American folk hero while appeasing their desire for a strong Haitian moniker. I’d taken it upon myself to anglicize Jean-Henri so I’d be able to fit in. But fitting in was awkward for a gangly, 6’1” kid with the complexion of a black grape, an oversized head, and large extremities. I could palm a basketball and wore shoes large enough for a pro athlete, but alas, couldn’t dribble to save my life. What I did have in spades was smarts and a rather velvety voice at such a young age. Even then, I figured I might have a future in radio. “You’re always daydreaming,” she said. “He’s living the dream,” the jock chimed, making reference to my head perpetually floating in the clouds. Marq paused and blinked, not understanding my brand of humor. “Whatever, man. Let’s get this over with.” He shook his head with a smirk and began trudging toward the building entrance, Lisa in tow. Well, I thought I’d said something clever that would make them take notice. Guess not. I pulled a flashlight from my bag and followed suit. The foyer leading to the staircase was black as a starless rip in the night sky. There was the spirit of an old doorman frozen in a long bygone era, when the neighborhood hadn’t looked like it’d been through a WWII air raid. In his dapper blue coat with gold trim and his hat placed perfectly, he stood proud. It was a warm summer evening and, as sharp as his outfit was, no living person in his right mind would wear such a heavy coat in this weather. But the dead were always dressed as they had been at the point of their transitions, their see-through bodies having no sense of hot or cold. Typical of the deceased, his eye sockets were hollowed out. This was a fact that used to scare the cornbread stuffing out of me when I was little, but was nothing to be afraid of once I’d gotten used to it. The problem was encountering a spiritual entity with eyes—something that made me cringe and my skin crawl with invisible spiders. But the doorman was nothing more than a harmless, interactive recording. And he was friendly, too. “Evening, sir,” I said with a nod of my head, to which he smiled. And you figured Marq would’ve finally gotten used to the fact that I could see ghosts and they could see me, too. That was part of the shine Gran-Pere recognized. I often saw my grandfather, too, whenever his spirit would wander into my room and stand guard over my bed. “You already know the deal,” Lisa said, shaking her head and stifling a laugh. She couldn’t see spirits, either, but she was an empath who could feel them. I chuckled and took that as a compliment. Without another word, we took to the stairs.